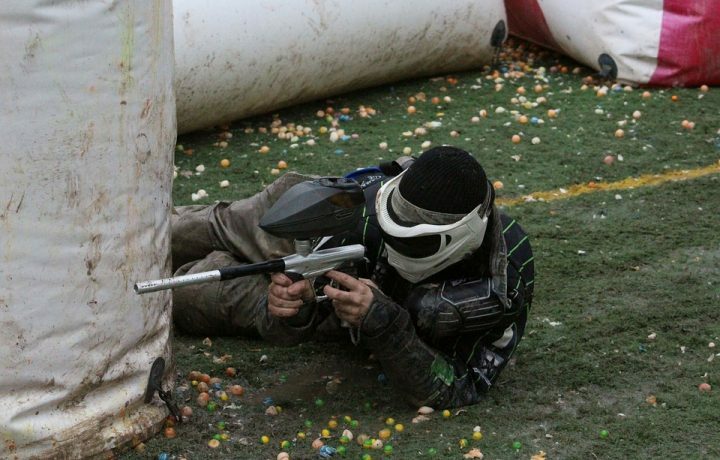 It is not always easy to find the best paintball guns. 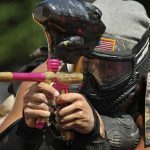 These days, there are so many different paintball gun styles it can be hard to choose which one is the right on for you. 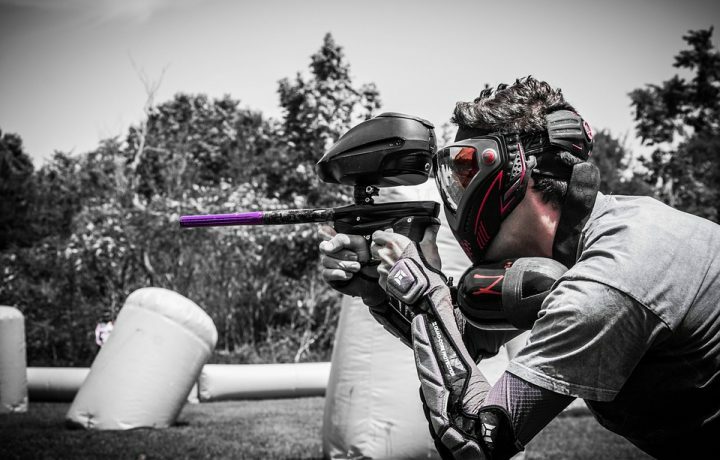 The good news is that we have put together a short list of the best paintball guns on the market today. Whether you are a pro or just beginning, there is a perfect paintball gun model for you. It doesn’t always mean that the most expensive gun is the right one for you. Here are the best picks this year. Our list of best paintball guns was based on price, usability, how easy they are to upgrade and of course the power and feel of the shot. The Phenom X7, just like the A5 can be customized insanely. In simulation games, this is not an uncommon sight. The upgrades for this visual, tactical look great as it sits on top of the light frame. There is a single mechanical shot that you can upgrade to the eGrip. It has single shot fire modes, three round bursts and is fully-automatic. One great e-grip cool feature is that if in mid-game, the battery dies, you can switch to single shots that a propellant powers. This keeps you in the fight and helps switch the gun to safety mode. 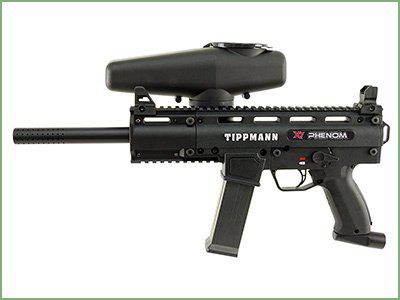 The Tippmann X7 Phenom can shoot up to 15 balls per second with the cyclone feed system with no batteries. It operates under 300 PSI. To save battery power, it also turns off the circuitry within. 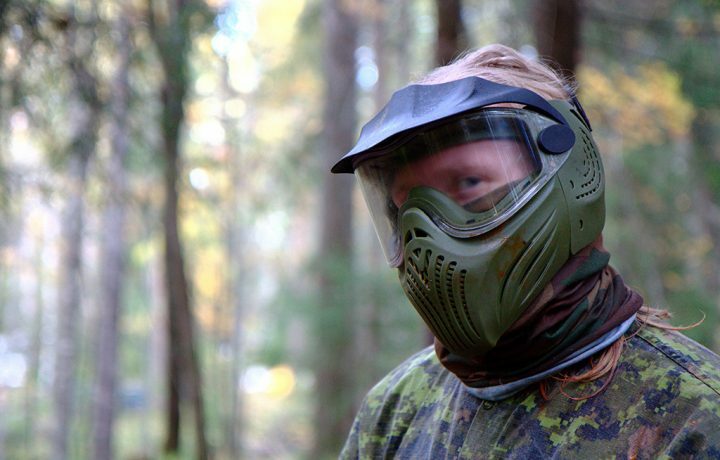 This is one of the best paintball guns for woodsball players, given its high accuracy. You might almost not notice the higher price. 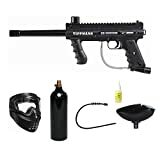 This gun is ideal for players that are searching for the best paintball guns for every type of paintball game, has available accessories and tons of options for upgrades. This truly keeps you on top of your game. With top-notch performance, only Tippmann can give, enjoy the M-16 military-style marker that is simply hard to beat. Like the Tippmann X7 Phenom, it uses a cyclone feed syste. The Tippmann Alpha Black Elite has a 12” ported barrel. It is a suprisingly realistic M-16 style gun, given its price. 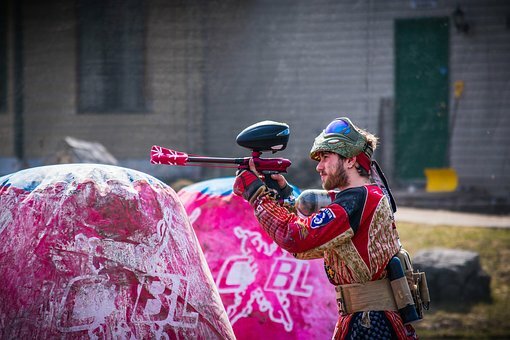 If you happen to be in serious tournaments for paintball, chances are you have seen this baby in action. This paintball gun is on the higher end of the cost spectrum and can truly unload fastballs of paint. One single shot features multiple modes of firing, full auto and ramping. You can quickly lay down heavy fire. Advanced players that are looking for a rock solid gun for playing paintball this makes an excellent choice. It is accurate and versatile and on more than a few wish lists, for sure. Advanced players that are looking for a rock solid gun for playing paintball this makes an excellent choice. It is accurate and versatile and on more than a few wish lists, for sure. 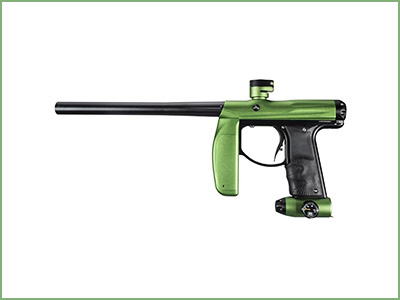 The other best paintball guns brand that puts out fantastic equipment consistently is the Empire Mini. Hands down, the market’s best paintball gun, it is also the smallest. This results in a very easy to control, lightweight gun. The electric triggering system makes it a fast-shooting experience the moment you pull the trigger, and yet it remains quiet at the same time.The comfortable two-handle gun includes a gauge for pressure on the air connector. Ideal for indoor play, this gun produces overall accuracy and a quick firing rate. One thing’s for sure—it won’t disappoint. The comfortable two-handle gun includes a gauge for pressure on the air connector. Ideal for indoor play, this gun produces overall accuracy and a quick firing rate. One thing’s for sure—it won’t disappoint. It shoots with up to 160-200psi. The stock barrel of this paintball gun model is .691. The barrel is cocker threaded, and the Empire Mini works on lp or hp. 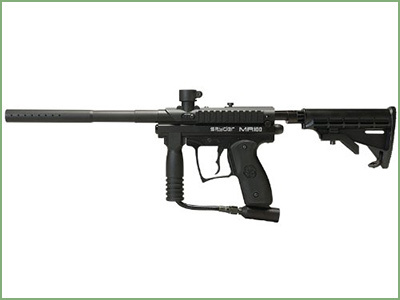 It is an understatement to mention how popular this paintball gun is around the world. From its affordable price that newbies find impressive to its ease of use and reliability, it comes as no surprise that local shops always have these sold out. The 98 Custom by Tippmann features an integrated rail system easy to upgrade anytime you want. For added accuracy and range, you can even include the tremendously popular flatline barrel. It has a 11rps cyclone rate and holds up to 500 shots per fill. 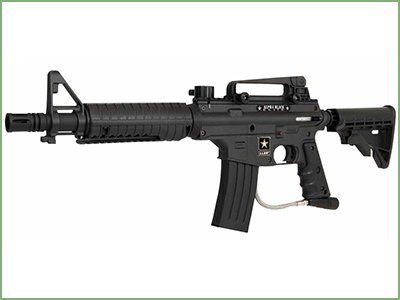 The Tippmann is also relative light, at just 2.9 lbs and has a range of 150-ft. The Tippmann is a fantastic.68 caliber rifle. You can read more about it in our Tippmann 98 Custom review! The Spyder MR100 looks a bit like the Tippman Cronus and has added accuracy with its sturdy stock. 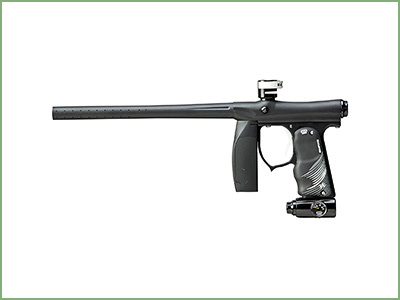 This paintball gun is made with high quality, and the all-black design looks awesome. This gun can take whatever paintball comes its way. There is a double tap default trigger that makes this versatile for either woodsball or speedball due to the decent range provided by the longer barrel. The Spyder MR100 features a 2-finger trigger and a M14-style foregrip. It also has a quick-disconnect pin. Entry-level players will probably find that the Dye Proto Rail is a higher price range than they would like. However, for those who don’t want to break the bank and want to upgrade to a higher-end gun, this is the best choice. Some of the best gear for paintball is made by Dye, and they do focus on producing top quality paintball guns. This gun can fire fifteen balls each second, and the fourteen-inch barrel shoots straight. It hardly chops paint, and every inch of this baby screams quality. This gun can fire fifteen balls each second, and the fourteen-inch barrel shoots straight. It hardly chops paint, and every inch of this baby screams quality. This paintball gun looks like a regular gun on steroids. There are tons of body kits that look realistic, and you can make it seems like a menacing HK417. With a broad range of barrels, grips, magazines, barrels, and stocks, there are almost endless combinations. The gun itself has a selector for firing on the grip for single shot and safety modes. It can fire up to fifteen paintballs with ease in one second. Go ahead and swap an upgraded electric trigger for the grip supporting single shot and fully automatic shots model. This paintball gun comes with a cyclone loading system and a loader right out of the box for a weapon loading experience that is smooth. This gun is perfect for players that want a balance between performance and price. In other words, it is the best gun for your money. The Cronus looks like a new and improved 98 custom. This is one of the best paintball guns options and is perfect for looking realistic for tactical games. This intermediate level gun has a cool look and features an optional removable stock and barrel shield. With supreme accuracy, it’s no wonder that all the reviews were positive. The Cronus does not disappoint with its grips, lights, red dot sights and a rail system for attaching a variety of accessories. There are exceptional overall durability and an affordable price range. This is a great option for a high-quality, reliable gun for intermediate players or even courageous beginners. The Cronus does not disappoint with its grips, lights, red dot sights and a rail system for attaching a variety of accessories. There are exceptional overall durability and an affordable price range. This is a great option for a high-quality, reliable gun for intermediate players or even courageous beginners. The Tippmann Cronus uses .68 caliber ammmo. It supports both CO2 and HPA, and weighs about 3.7 lbs. 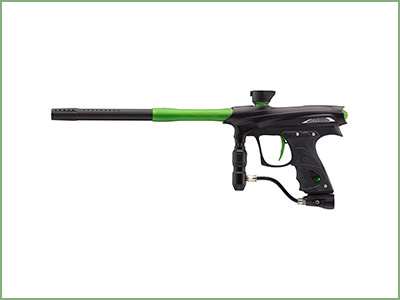 The X7 Phenom by Tippmann has to be the best paintball gun of the bunch. Not only is it upgradeable in unlimited ways, but it also looks fantastic. In fact, just carrying it around will make you look like a paintball gun expert, you might win the game with just your appearance. Even with the somewhat higher price range compared to most of the other guns, it still is considerable value for money since you probably won’t want another gun for years to come or, ever. 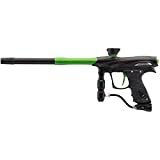 This gun is top of the line and is perfect for all levels of players and all paintball game types. You can even upgrade to an eGrip that has both single shot and three round burst modes. With a paintball gun like this one in your arms, you won’t need anything else to win the game with the best paintball guns of the bunch. The Tippmann X7 Phenom is highly overrated and overpriced. You say that you would not notice how pricey it is. But I did. I also didn’t think it was all that. Can you explain more what is really so remarkable about it? What does it have that other paintball guns lack? 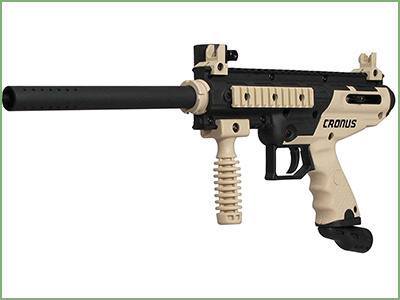 Of all of the paintball guns I’ve tried, the one that I liked the best is the Tippmann Cronus. I thought it was easy to use, it was highly efficient. Though it’s not easy for a newbie. If you have experience I’d say go for the Cronus. 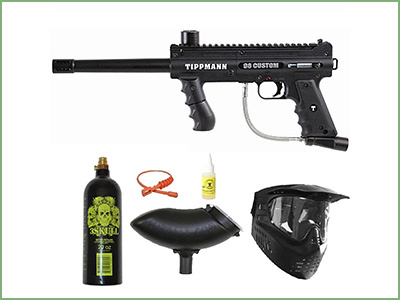 The Tippmann A5 is really efficient which is great for someone who has a lot of experience with paintball. However, noobs would find this paintball gun overwhelming. That is not a recommendation for anyone who is starting out. That is my 2 cents. I feel, personally that the Tippmann make is way overrated. 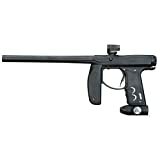 If I were to tell you what the best paintball gun is, it would be none other than the Empire Axe. Nothing is as powerful as that one and it’s better than Tippmann. Thanks a lot for your feedback, we appreciate your opinion. 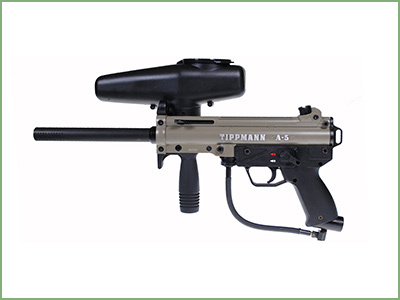 Any paintball gun made by Tippmann, in general, has my vote. They are superior and no other make even comes close. I am a proud owner of one and would never trade it in, ever. It’s my baby, what can I say? The Empire Mini is very strong and very powerful. I have not used a paintball gun that is better than this one. 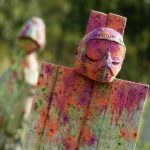 I also think this could be good for someone who is a complete newbie to paintballing. It’s easy to use. My favorite paintball gun is the Empire Axe because it is so powerful and it puts the others to shame IMO. It is also pretty simple to use. I would be interested in hearing what others would say about this one. 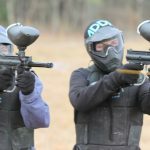 I think the way to determine which paintball gun is best for you is what you want to get out of it, how experienced you are at paintballing, and your general preferences. This review site is really good and only the best ones out there will be reviewed here.